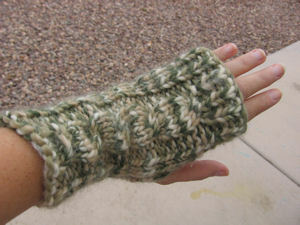 I went to a knitting class on Sunday to make cabled hand warmers. So fun! I finished this bad boy and promptly went home to make the second one. 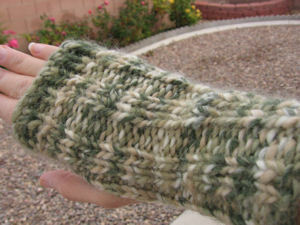 La di da… knitting the right warmer. Finished and now seaming it up. Wait! WHAT HAVE I DONE?? That’s right. 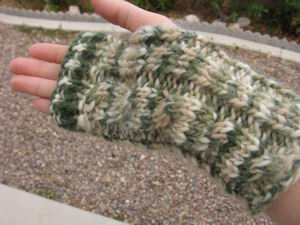 I knit the left hand AGAIN! And I didn’t even notice until I was finished. But I didn’t have the heart to frog it. I also had James consoling me and telling me that it was ok and no one will notice. Needless to say I will never wear these in public and have started making more. But I will follow directions. LOL- Don’t think I would have ever noticed. Post pictures of the new set if you can. Great posting. dude, whatevs! i’d totally wear them anyway! haha. girl, i had no idea you didn’t even follow directions..haha.. wear them anyways..
Too cool! Love, love love the wool you used. These are so cute, and you wouldn’t even notice, especially not if you’re wearing long sleeves/ a coat or something. Well done Leslie. I’ve never been able to get the hang of Knitting. Crochet now, well that’s a different thing. Hope you and james have a Wonderful Christmas and a Great New Year. They look really cool though!!! Here via Michele’s and glad I stopped by lol. James was right. I can’t tell the difference! Merry Christmas from me and Michele. Am I a dumbass if I can’t tell the difference? LOL! I wish I had the patience to knit!